Music is not only about notes, speed and melodies; a fundamental element is dynamics. We can play our instrument louder, harder, softer or even stop playing it. Often we use the volume control on the guitar for a quick change in volume, but unfortunately the potentiometer on a guitar or bass has some disadvantages: It degrades over time, it’s often noisy and it changes the impedance of your signal which then dampens the tone. It also affects the dynamically reacting pedals in your signal chain. Depending on its gain structure, even your amp can react differently to changes in the incoming volume. 1.) Placement: Let the whales sing! Finding the right place for your volume pedal is not trial & error, but more a matter of taste. Changing the volume can affect the operation of the following pedal(s). Let’s say your chain is guitar -> volume pedal -> overdrive pedal -> amp. If your overdrive pedal gets 100% signal it creates an overdriven signal as expected. If you turn down the volume of the signal going into the overdrive pedal, this pedal reacts. It won’t overdrive as much. This applies to most of the overdrive and distortion pedals out there. They are also called “dynamic effects“ as they interact with their input signal. Imagine this: You set the water tap in your kitchen to a desired amount of pressure, perfect for cleaning the dishes, but not flooding the whole kitchen. But then someone (maybe your cheeky kid) turns down the main water supply in the basement a little, there’s now less water pressure in your kitchen. Although your tap is still at the same position you’ve lost that perfect setting and may have to cancel the kid’s pocket money for a month. I told you: it’s all about interaction. Fading-in the volume with your volume pedal slowly from 0% to 100% after you attack the strings, will produce very atmospheric “singing“ notes. Instant Pink Floyd, instant ambient. Don’t lose yourself and then say I didn’t warn you. Now the volume pedal is acting like a master volume control for your chain. The overdrive and delay always get 100% of the signal but the volume pedal at the end of the chain sets the output volume. Great for instantly muting a sound or just turning the signal down a little bit without affecting the amount of distortion produced in your overdrive pedal. But keep in mind that the volume pedal now also cuts the delay or reverb tail. It’s absolutely a matter of taste if you like this or not. Some people like to produce a distortion via a pedal and have their amp’s set on a clean sound, while others use the distortion channel of their amp. Placing a volume pedal in front of a distorted amp is the same as placing a volume pedal in front of an overdrive/distortion pedal: the amp reacts dynamically to the incoming volume change. Some players like this, so that they can decrease the amount of distortion produced by the amp, but others would like to control the volume of the amp, but not the amount of distortion. If your amp has an effects loop: use it! 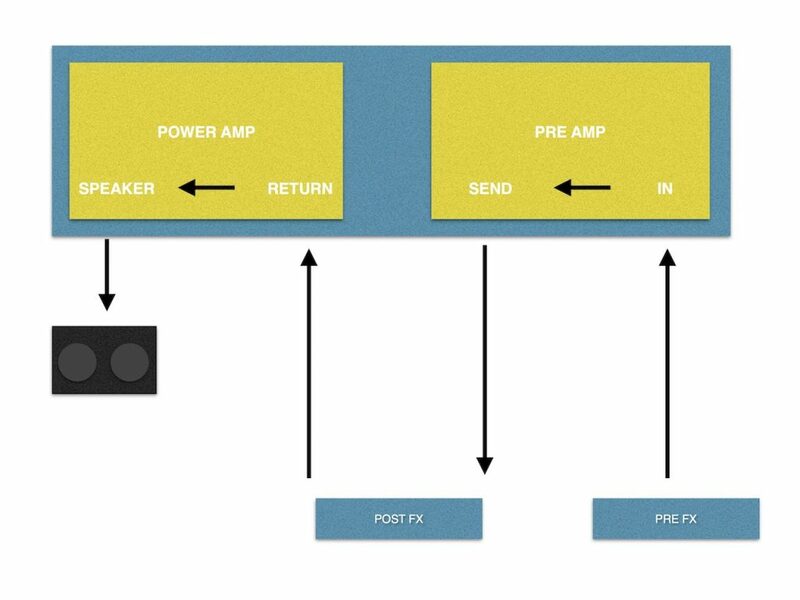 An amp’s effects loop allows the chance to send out the signal after your preamp and send it back before your power amp. Often we place pedals like chorus, flanger, delay or reverbs in the effects loop. So called “modulation-pedals”. Most of us like these pedals fed with a distorted signal, but not vice versa (however, I recommend you try it). Take your volume pedal and place it straight after the effects send of your amp. Then, if you want, go into your chain of modulation pedals and finally back to the amp’s effects return. Now the volume pedal acts as a master volume control. Your overdrive (produced via pedal or amp’s preamp) will still be the same, but you are able to fully control the amp’s volume. If your amp’s effects loop is a parallel one, turn its dry/wet control to 100% to get full control of the volume. Dialling the control to another position, e.g. 50%, gives you the ability to fade in your modulation effects and add them to your original sound. Don’t have a parallel effects loop? 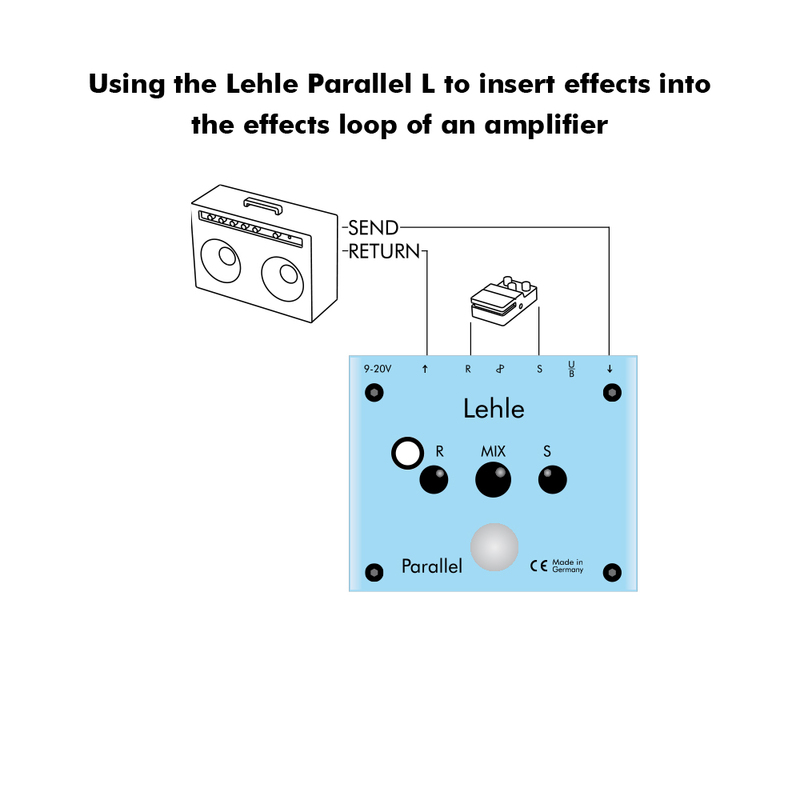 No worries: placing a LEHLE PARALLEL L in your serial loop makes it parallel. Place a volume pedal in the PARALLEL’s loop and you’re ready for take off. The order of the effects and volume pedal in the effects loop is the same as mentioned above: placing the volume pedal before our effects acts as a fade in for effects. Placing it after the effects cuts the tails of reverbs and delays but also mutes the chain completely: no noise produced by pedals (especially distortion) is audible anymore. Finally: silence. 2.) Freedom for your hands! After talking so much about different places for a volume pedal and its influences in the chain, let’s talk about freedom. There are a few people out there who perfected the way to control the volume on the guitar with their little finger while still playing. On a Strat style guitar this is doable, but if you own a Les Paul style guitar, you simply need a longer finger. Beside the disadvantage of not having the ability to change the order of the volume control in your chain, controlling the volume with your foot is something completely different. Controlling your signal and its dynamics expression via your foot needs to be learned, but the results are worth it. Here’s a video of our artist Luke Cyrus who has perfected his use of our MONO VOLUME pedal. Now, since your fingers cheer “we-are-free“ let’s jump to “wear-free“. Potentiometers have a mechanical stress. The taper inside has a limited lifetime. Pots are prone to be noisy and to crackle. In volume pedals there’s an additional mechanical stress: strings (redirecting the energy from the pedal to the pot) can brake and gears can wear out. 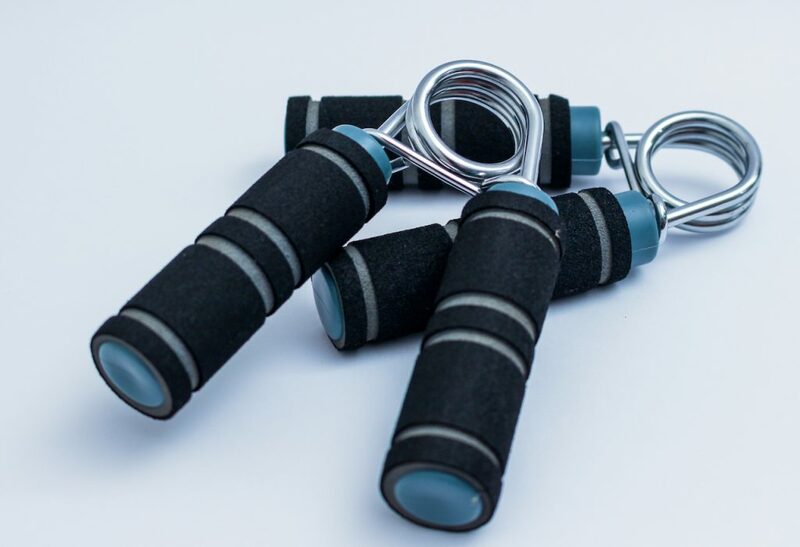 At LEHLE we thought about how to avoid that typical stress and reduce it to a minimum. Using a magnet and a hall-sensor to measure distance works like a charm. Read all about our volume pedals here. 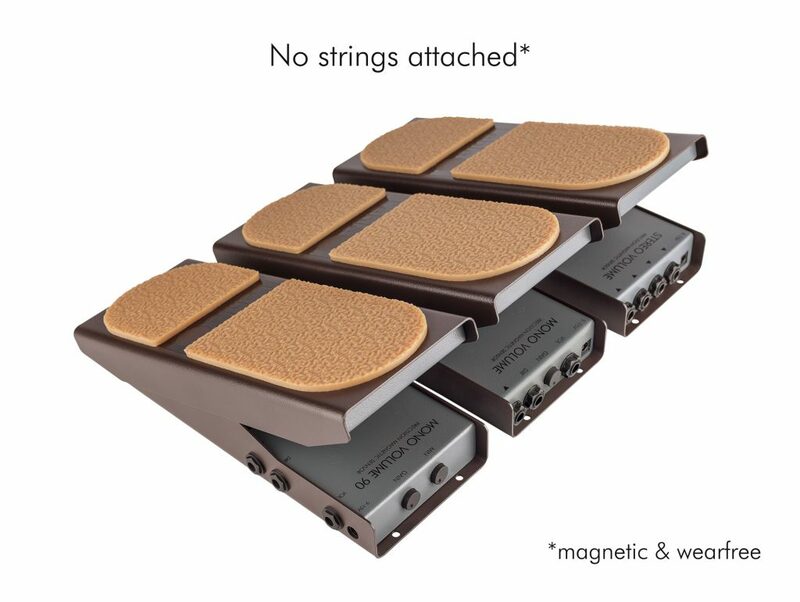 Since our volume pedals are active, you also don’t need to worry if you picked up the right one. There’s no Lo-Z or Hi-Z version. 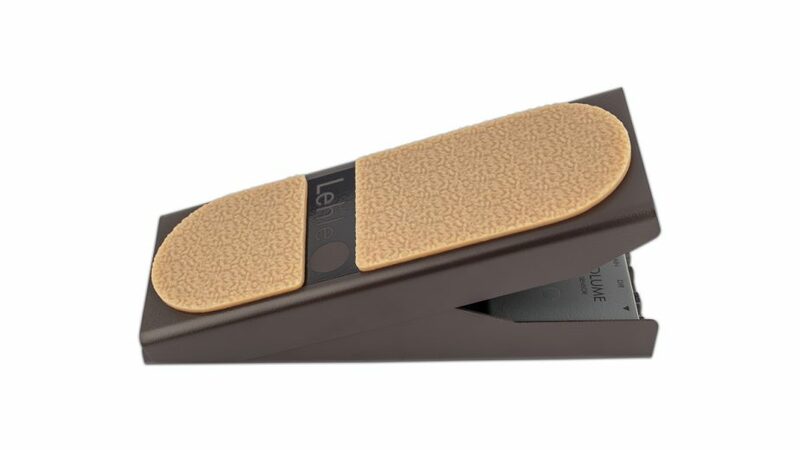 The input of the LEHLE volume pedal is high impedance and the output always low impedance. And you get it: you can use it as a buffer. Check-out this post and find out more about buffers. If you use one of our volume pedals you will change the volume, but not the sound. Isn’t this what you always wanted? Another side effect of having a passive volume control (volume pot on your guitar or pedal) is that usually the more you turn the volume down the more it dampens your sound because of the change in impedance. This is an unwanted side effect of using a resistor to change the volume in electronic circuits, because suddenly capacity is an issue and …it’s complicated. Having an active VCA (Voltage Controlled Amplifier) to control the volume does not have this disadvantage. If you use one of our volume pedals you will change the volume, but not the sound. Isn’t this what you always wanted? We all love vintage. We love the vibe and flair of old stuff, furniture, cars or instruments. It gives us unmistakable memories and the feeling of holding history in our hands. It’s great to go for a spin in your Mustang at the weekends, isn’t it? But having it as a business car or for the family, it’s a different story: traffic jams, high wear and lots of fuel consumption it’s definitely no fun. We want a car that’s easy to handle. We want power steering, assisted braking, low stress and maybe automatic transmission. And smartphone chargers, because it makes everything easier. Our LEHLE VOLUME series makes things easier as well. In 2015 when I had one of the first prototypes of the renowned MONO VOLUME for tests, I noticed that the movement of the pedal was very light, like there was too little resistance. So I tightened the brake until I had the familiar feeling of my old volume pedal. After a few days I loosened the brake more and more because I suddenly had the possibility to do so. 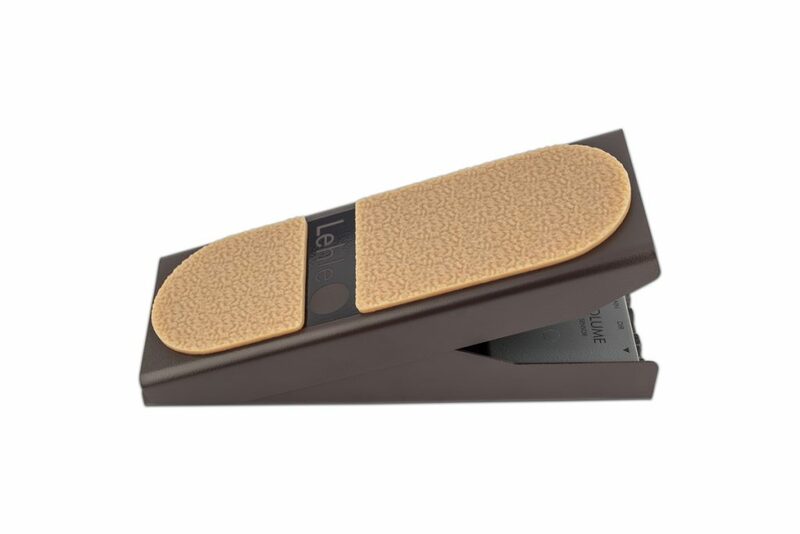 Immediately the volume pedal was able to adapt and translate the expression of my foot. There were no “jumps“ in volume. If you drive with your vintage car and you suddenly need to brake, you know that you need a lot of power to move the brake. Aside from the fact that driving a vintage car could replace the gym, there’s a lot of mechanical stress in the car because of the many parts in a direct transmission. Vintage car or gym? It’s up to you! Today’s cars have a way more efficient transmission and although they don’t work every time the way we want, there’s much less mechanical stress on the parts inside modern cars. Using our volume pedal let’s you shed bad habits, you can now leave your contact cleaner at home and fully concentrate on your performance and expression. More Volume – less stress! You did it! Now you maybe know a little bit more about the placement and interaction of volume pedals, what they can do for you and the potential wear inside them. We never thought that updating such a simple device could be such a challenge, but we were sure that strings and gears were something which should stay in mediaeval times.